When time is of the essence, folding chairs are smart and affordable features to incorporate into any event's decor. When a large audience is expected, these items are simple to arrange and take down and work perfectly for inside or outside gatherings. 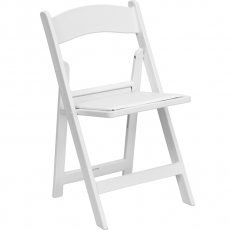 For instance, folding chairs work well at graduation ceremonies, weddings, and conventions. When space is in high demand, these chairs provide adequate seating without creating a cramped environment. Thanks to their lightweight construction, they can be transported quickly and efficiently so that an event can last as long as possible. Unlike the muscle power required to move heavier and more robust furniture pieces, these are simple to carry and stack. Although some individuals may be skeptical about style and comfort, folding chairs are convenient seating options that offer a restful experience and an aesthetically pleasing appearance. Thanks to our large variety, you are sure to find something that meets your needs. 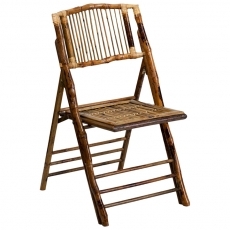 We offer wood, plastic, and bamboo folding chairs in a wide range of colors. This allows you to get creative and fulfill the vision of your event. 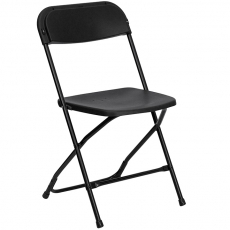 All of our folding chairs are durable, sturdy, and can withstand different weather conditions. Whether you are hosting a casual picnic-style barbecue in your backyard or need seating for a more formal celebration, we have the ideal folding chairs available for rent. Peruse our rainbow of colors and variety of styles and select the ones that build the perfect ambiance.